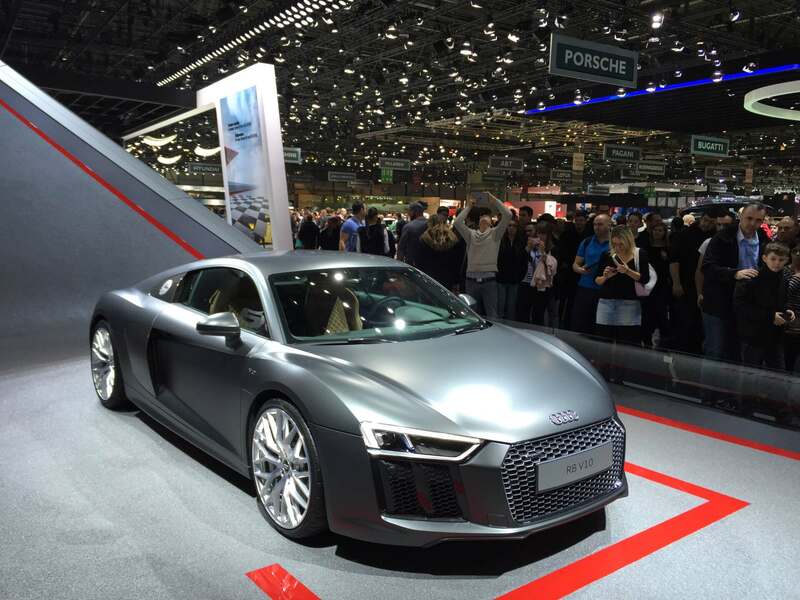 The second-generation Audi R8 has now been completely revealed, and I flew to the 2015 Geneva Motor Show to see it. 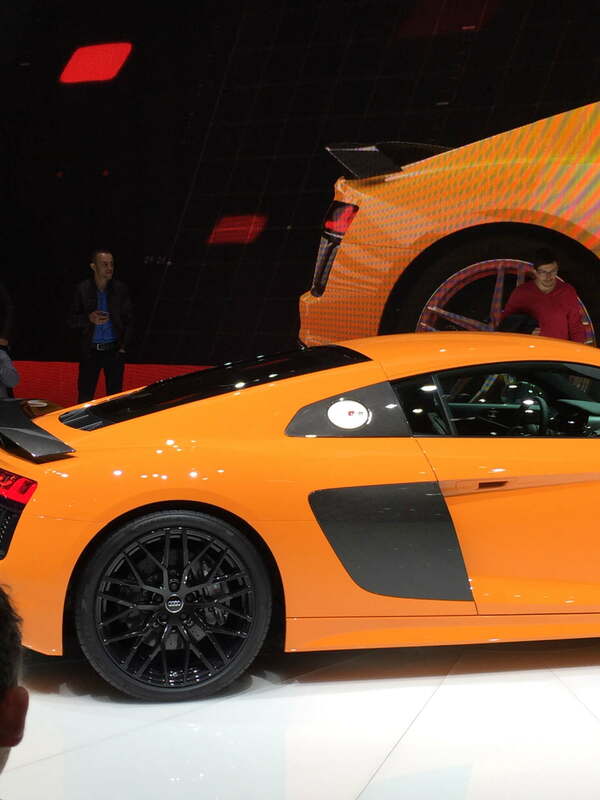 Here are all the details on the car that may set new standards in the Supercar class. 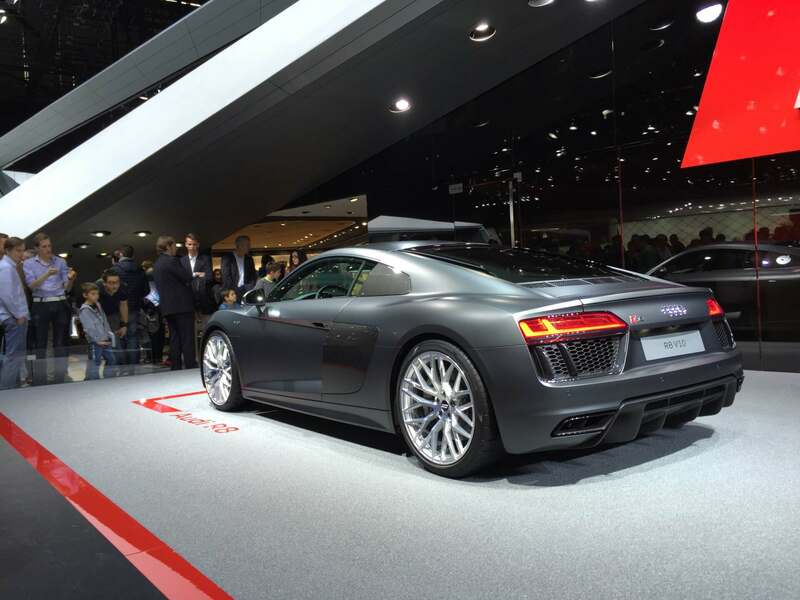 The Audi R8 supercar came out in 2007, and proved to be a huge success for Audi. The new car will rival the latest Porsche 911, and will initially only be available with a twin-clutch S tronic transmission and a V10 engine with either 533bhp or 602bhp. 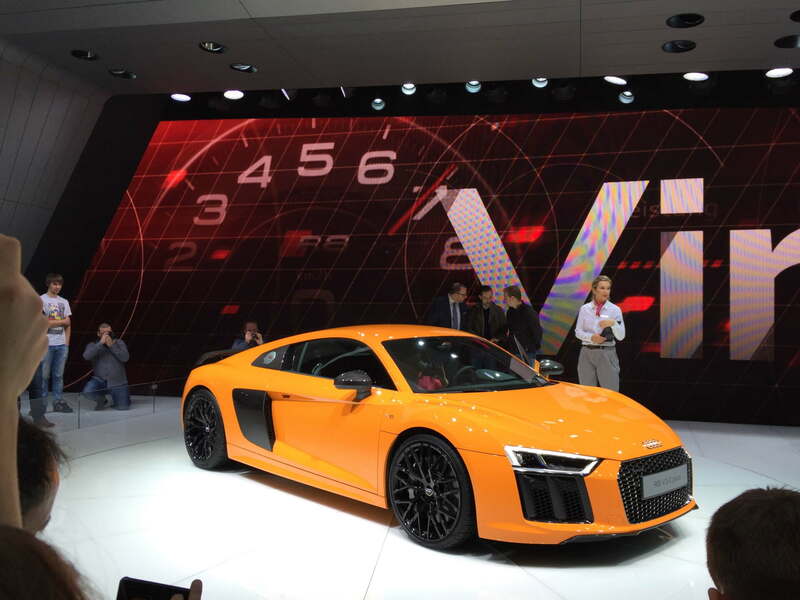 The quicker V10 Plus covers 0-62mph in 3.2 seconds and hits 205mph flat-out at full chat. A new aluminium and carbon-fibre chassis shared with the Lamborghini Huracan means it weighs 50kg less than the current R8, and it is 40% stiffer. 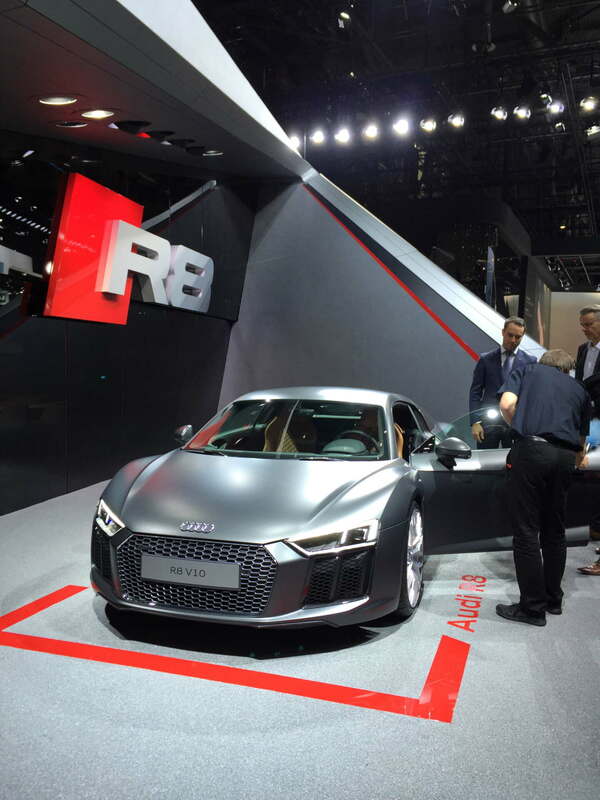 Also there will be a new all-electric 456bhp R8 e-tron model with 920Nm of torque, a range of 276 miles and a 0-62mph time of 3.9 seconds – and you will be able to buy one starting this year! From reading the latest news, UK prices for the entry model are confirmed as £119,500 for the ‘base’ V10 and £137,500 for the 602bhp V10 Plus. 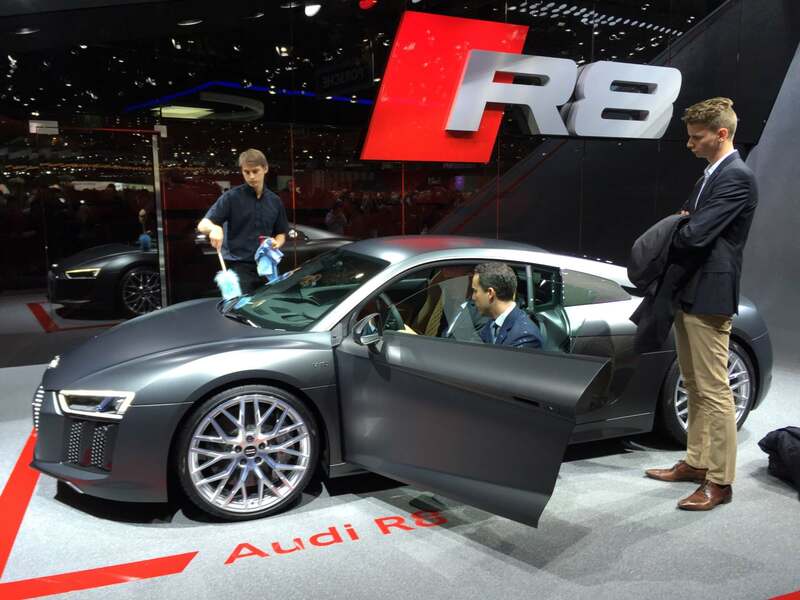 UK deliveries of the new R8 will be in late 2015. The design is a subtle evolution from the current R8 – the dimensions are virtually identical, except for 40mm extra width. The aluminium skin is wrapped around the chassis and features a more aggressive front end, split air intakes at the front and grill which matches the TT which will be tacked-on to the next-generation of hot RS cars. The iconic side blades have been carried over, although they are now split in two, which I feel is a mistake. An aero-optimised diffuser sits at the back and boosts downforce. A new exhaust design (a sports exhaust is optional on V10 model, standard on V10 Plus) with squared-off tailpipes has been introduced, which sits flush with the rather square reshaped rear end. The rear end design is debatable, and while I have seen it in the flesh at Geneva, I reserve judgement until I see it on the road, as my current R8 is a lot more curved. Standard LED lights at the front and rear feature a criss-cross design, while laser spot headlights that increase high-beam coverage to 600m in front of the car, are an option, together with I imagine many other extras! 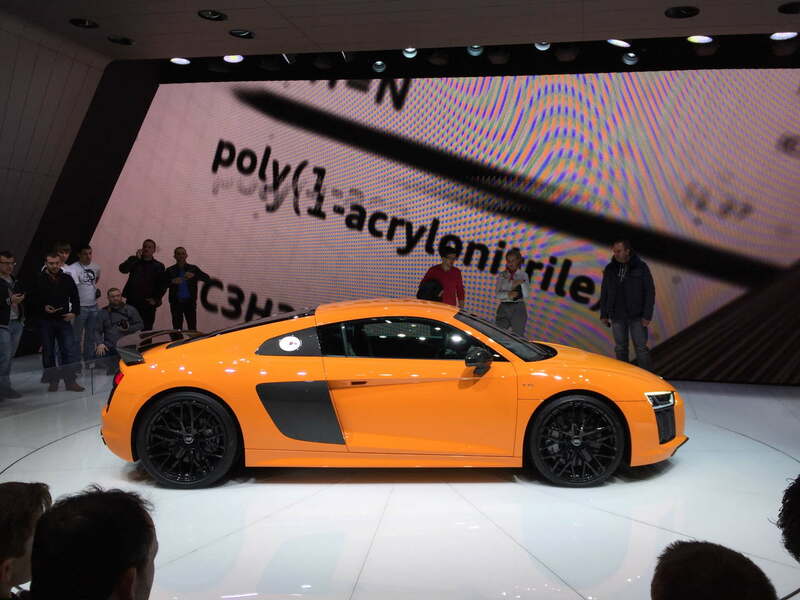 The V10 model has a pop-up spoiler at the rear same as the current R8, while the V10 Plus comes with a fixed rear spoiler, front splitter and diffuser made from carbon fibre. There will be ten exterior colours available, including a new matt finish Camouflage Green, and while 19-inch wheels are standard, 20-inch alloys are offered as an option. 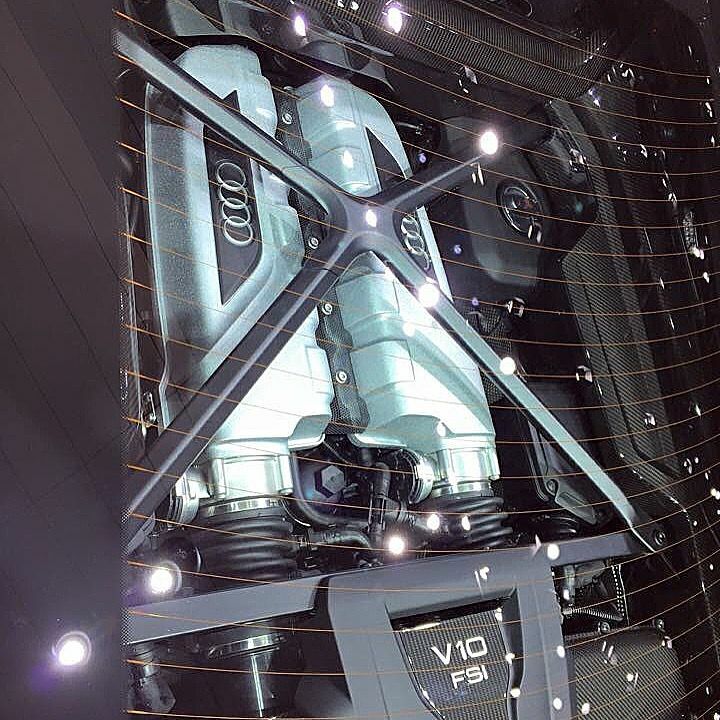 There are rumours that a V8 and even a V6, both turbocharged, will follow in the future but the new R8 will be offered only with a dry-sumped V10 engine from launch. Would you want though a supercar with a V6 engine? Two power outputs will be available, either 533bhp or 602bhp in the V10 Plus model – that’s 60bhp more than the outgoing V10 Plus. There’s no manual option, only a seven-speed S tronic gearbox and four-wheel drive as standard. So the familiar and much loved manual gate will be no longer. The V10 Plus model is capable of 0-62mph in 3.2 seconds, 0-124mph in 9.9 seconds and a 205mph top speed, putting it firmly in the supercar performance league. 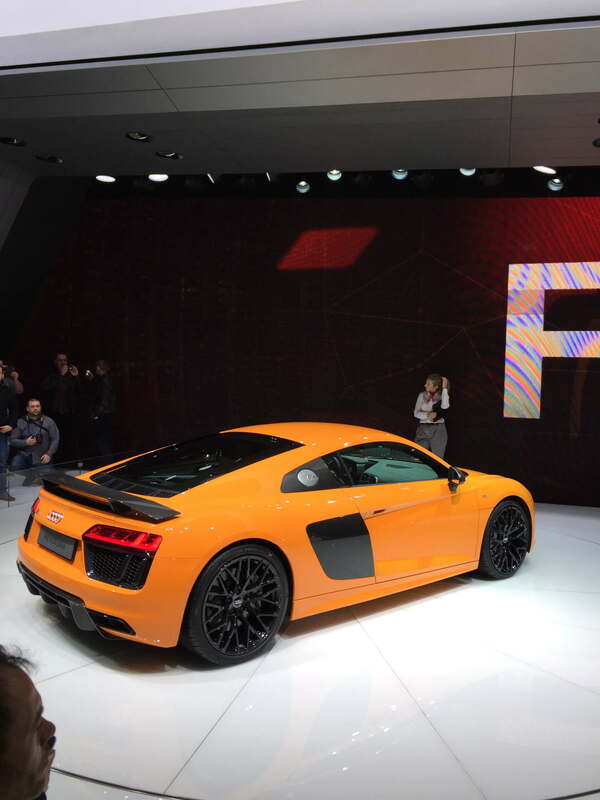 The standard V10 covers 0-62mph in 3.5 seconds and tops out at 201mph. 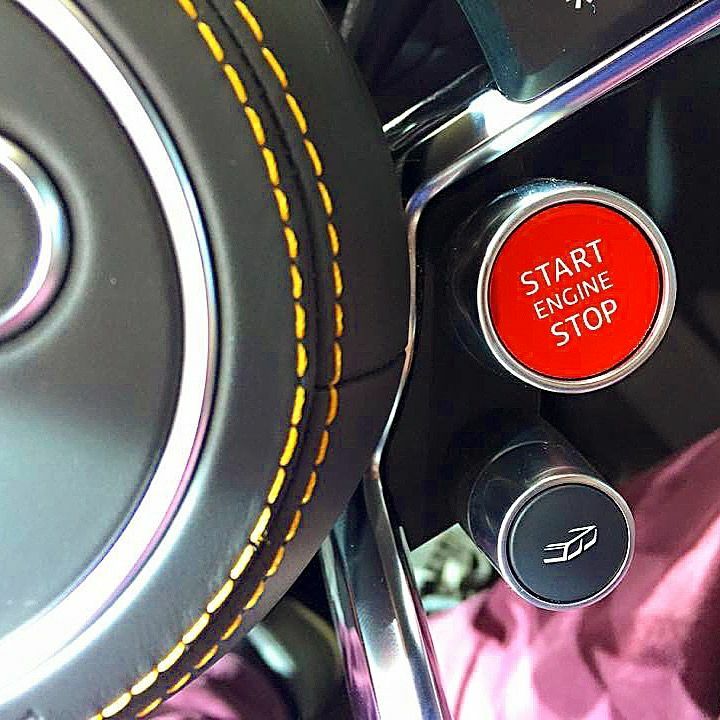 Fuel consumption is improved by around 10 per cent thanks to the addition of stop-start, a costing function when you come off the throttle and cylinder deactivation that shuts down one bank of cylinders during gentle cruising. The result is fuel economy and CO2 emissions of 23.9mpg and 275g/km in the 533bhp model. How this will sound and whether you will notice the difference I hope to tell you when I go for a test drive later in the year with my friends at Southend Audi. Double-wishbone aluminium suspension is fitted at every wheel station, with adaptive magnetic dampers as an option. Also optional is a variable-ratio steering rack on both models and carbon-ceramic brakes discs on the entry-level model – they’re standard on the V10 Plus. The new quattro four-wheel-drive system is capable of sending up to 100% of the torque to the front or rear axles if needed, while a mechanical limited slip differential splits it between the back wheels. The chassis is shared with the Lamborghini Huracan (although the wheelbase is stretched by 3cm), and uses the same combination of aluminium and carbon-fibre to drop the weight to 1,555kg – 50kg less than the old V10 Plus. The body panels are all aluminium, the fixed rear wing on the V10 Plus is made from carbon-fibre. The chassis is around 40 per cent stiffer than the current car too. 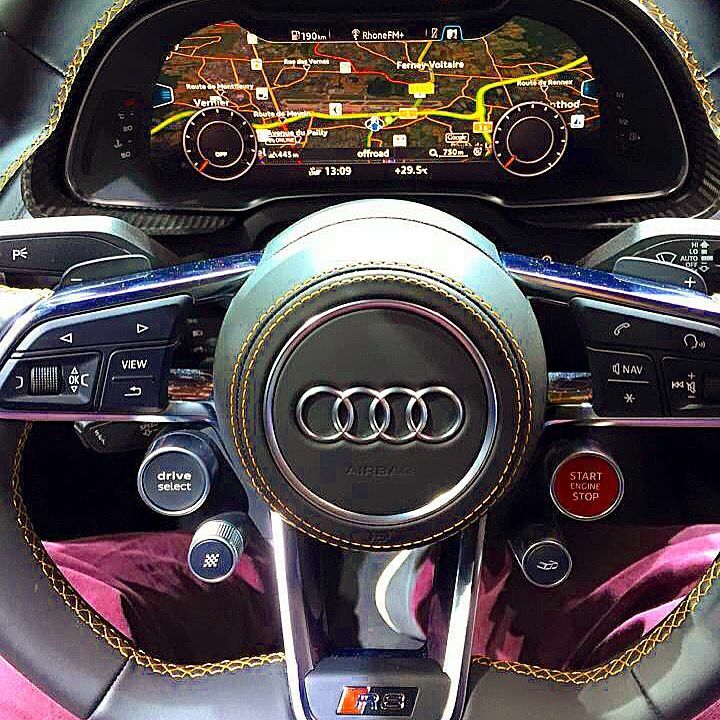 The interior is typically stunning, as all Audi’s are. A 12.3-inch TFT ‘Virtual Cockpit’ replaces the dials and can be configured in a variety of ways. Everything can be controlled from the multi-function steering wheel, or there’s a control wheel on the centre console and a bank of switch and air-con controls sit above that. Its functional and puts the driver firmly in control, for a total driving experience. 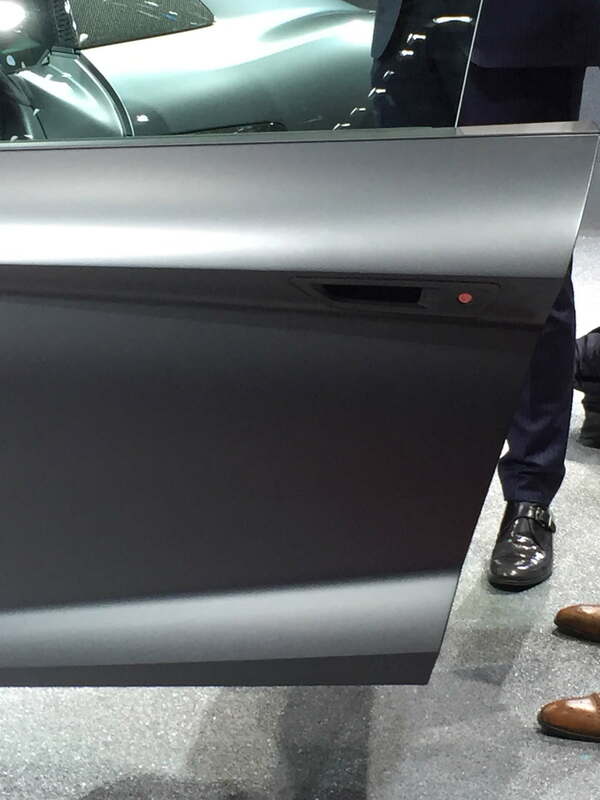 Four new buttons on the steering wheel form the controls. 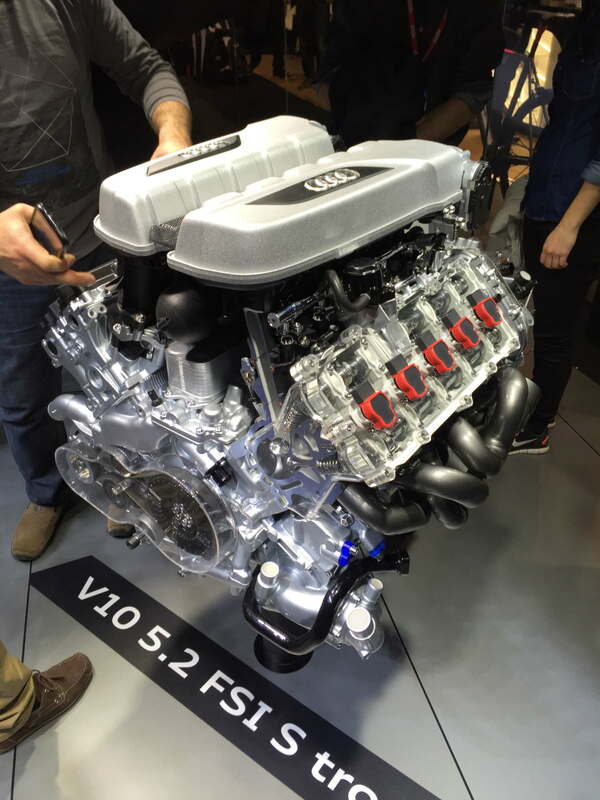 A large red button starts up the V10 engine, another lets you switch the exhaust noise. I have a Quicksilver Titanium Supersport on my current R8, so it will take some beating! The button marked Drive Select let’s you toggle through the four driving modes – Comfort, Auto, Individual and Dynamic. Each tailors the throttle response, steering weight, gear change, ESC threshold, and torque split of the Quattro system. The ‘Performance’ button lets you choose between snow, wet and dry settings. 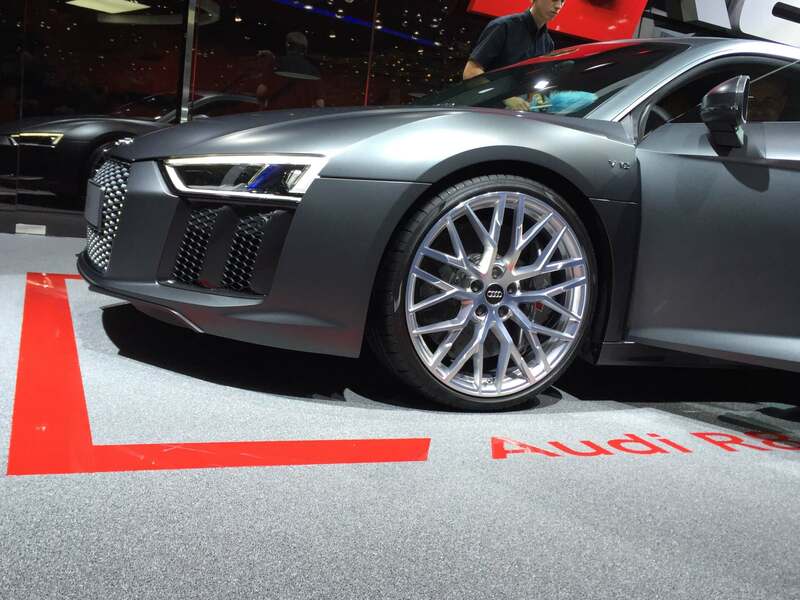 Audi has also unveiled details on an all-electric, rear-wheel-drive version of the R8 at the Geneva Motor Show. 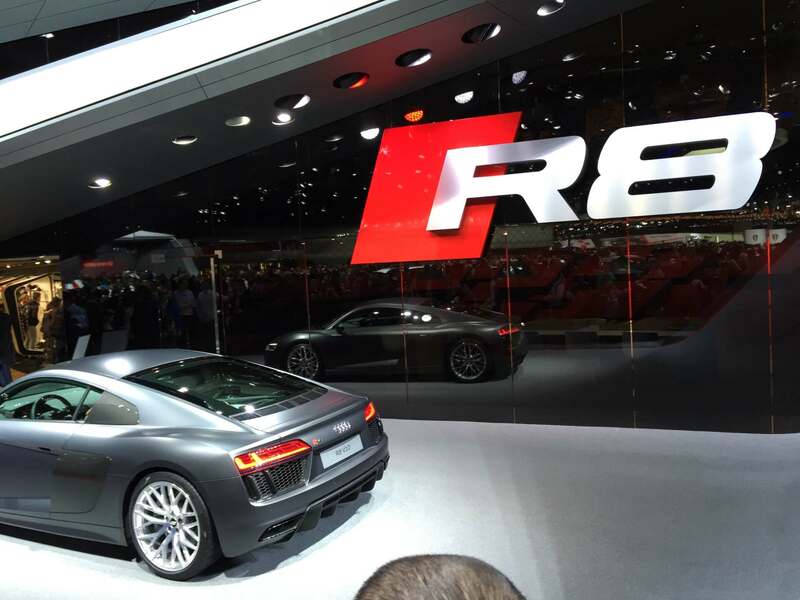 Called the R8 e-tron, it uses two electric motors on the rear axle – producing a total of 456bhp and 920Nm. Audi claims it can cover 276 miles between charges (compared to 134 miles for the previous car), and charging it can take as little as two hours using a rapid charging point. But whether you can find a charging point and whether it works when you do find one is another story! 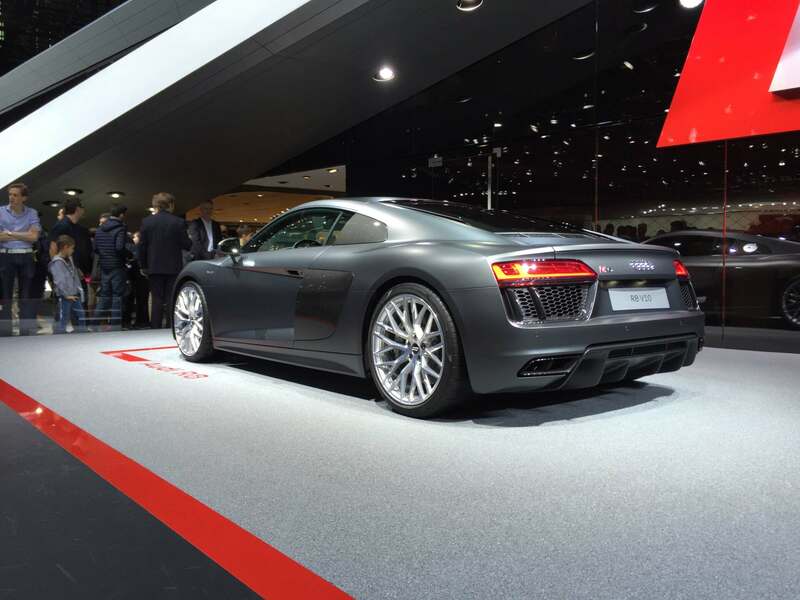 I hope you enjoy the photo’s I took at Geneva for you, and I have also included 3 shots of the new R8 taken at a filling station – the first out there! I am looking forward to my first test drive later in the year, only then and after I see it on the road will I really know if it will be a winner. 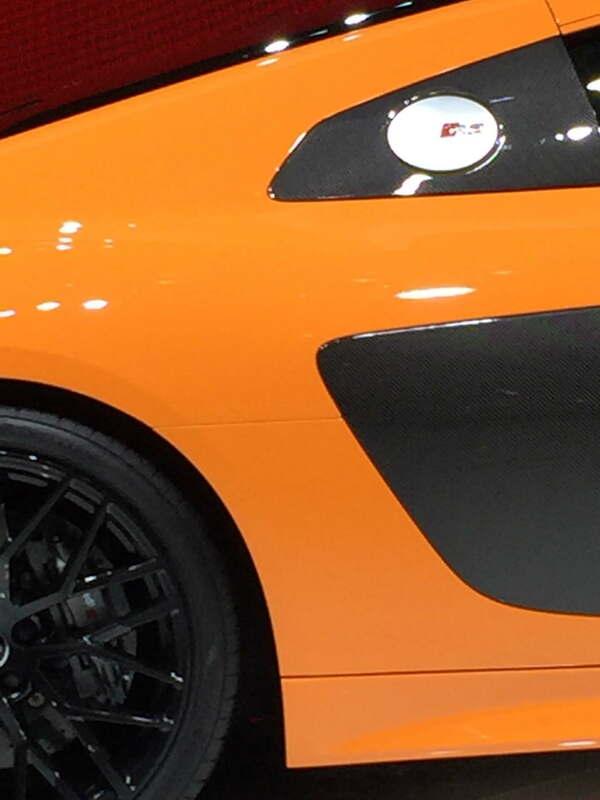 For me looks are just as important as performance in a supercar – so watch this space!